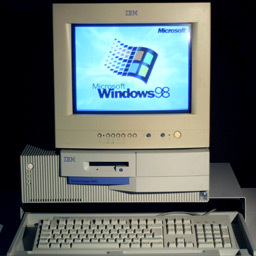 "When I started fixing computers in 1998 a typical PC looked like the one at left and ran Windows 98. Yes that was a long time ago! Since then I've established relationships with all kinds of people in the Hollywood, West Hollywood and Beverly Hills areas. They come from all walks of life: lawyers, psychiatrists, retired persons, screenwriters, small business people, and more. Some of the testimonials below are written by clients I've had since 1998 - over 18 years! Some of these folks have never even used other tech people since I set up their first computer. ROGER BURNLEY, HOLLYWOOD: I have used Don for years and highly recommend him. Recently I was in a terrible mess with both my laptop and desktop computers and he was able to get to me right away resolve it all and save my data! That surely also saved my business. He is efficient and punctual and always a pleasure to work with. F. MAHDESSIAN, LOS ANGELES: Don has taken care of my computers for 18 years. He is very talented, knowledgeable and knows exactly how I want the computer set up so to make it easy for me do my work. He has worked for many large movie studios . He is very professional, efficient, always on time and polite. I highly recommend him for your computer needs. GRAHAM BERRY, LOS ANGELES: I practice law from my home office where I have a small office computer network running Windows software. It has been maintained for the past eight (8) years by West Hollywood Computer Repair which is operated by Don. During that time I have replaced my desktop computers, printers, and laptop twice. Each time Don has done the set-up and transfer of programs and data. In addition, he has done regular bimonthly maintenance, repair and updates. He has also set up my home entertainment system for me and has taught me how to use both hardware and software. Don's service and work has always been excellent and superior to computer service specialists I have used in the past. He promptly responds to my requests for assistance which he is sometimes able to resolve remotely for me. In my experience his rates are very reasonable. MASON SOMMERS, BEVERLY HILLS: Don has been working on our computers since 1998. He has helped at both our home and offices, and keeps things running smoothly. He has transferred data and programs without incident, and has de-bugged us when we inadvertently downloaded various viruses. He is more reasonably priced than others whom we have tried when he was unavailable, and inevitably he has to fix what others have messed up! I most recently took him with me to purchase newer computers as his knowledge about what is available and what is coming in the future is spot on. He is well-versed in Mac and PC, desktop and laptop, and has networked all of our machines. In addition, he has removed hard drives when we have gotten rid of older model computers thus securing our privacy (we never would have thought about that!). DAVID CASON, BEVERLY HILLS: "Don has an easy going temperament which goes along with being able to help Tech-Neophytes and Tech-Xenophobes like myself. He always seems ready to attack problems, and always does solve, as he has been doing this for years - he won an Emmy for Computer Enhanced work on Steven Spielberg's series "PACIFIC" about WWII USA vs. Japan . He is an artist in Computer designs, and that can help in using and fixing computers, as that in itself is very complicated and needs strong, safe, and thoughtful advice. I would recommend him when you need someone who has experience with all sorts of problems, either small/minor or large/significant." DON MCAFEE, WEST HOLLYWOOD: "Don has been fixing my computer for about a decade. I think I have had about 3 computers and we purchased them all together. He comes over about twice a year or if I have a virus and totally fixes it usually in two hours. He showed me how to clean the dust out of it so he wouldn't have to come over and do it. He does a good job explaining all the computer jargon. I'm a senior my generation didn't have computers but he makes it easier to use. He enlarged the text and the mouse pointer and it's much easier now. And he is very friendly and funny too.